Dental plaque is a soft, sticky substance that builds up on your teeth. It is mostly made up of bacteria, which feed on sugar from food and drink, producing acids as a waste product. The acids attack the teeth by dissolving the minerals in the tooth surface. If this happens too often, tooth decay results. For this reason, you shouldn't have sugary foods and / or drinks too often during the day. Minerals in saliva can mend the teeth. If fluoride is present in the mouth, it helps teeth to repair themselves. Fluoride also makes bacteria less able to produce acid. To remove plaque and help teeth to mend themselves, you need to brush twice a day with a fluoride toothpaste. You also need to brush to stop plaque damaging your gums. If plaque is allowed to build up, the bacteria in it can make your gums sore and infected. Painless gum 'pockets' will start to form around the teeth - and bone supporting the teeth will slowly be lost. If left unchecked, gum disease will lead to the loss of teeth. Brush your teeth thoroughly twice a day with a soft-to-medium brush and fluoride toothpaste. Replace the brush when the bristles get out of shape. Put the bristles at the join between teeth and gums, pointing towards the gums, and brush using short circular movements. Brush all round every tooth, carefully making sure you can feel the brush on your gums. Don't use too much force - give your teeth and gums a gentle scrub. Thorough brushing takes two or three minutes; why not time yourself? 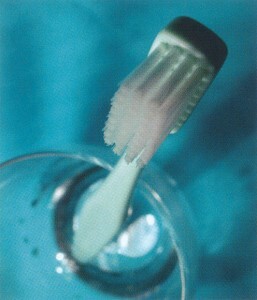 After brushing, you should spit out the toothpaste - but do not rinse, as this lessens the effect of the fluoride. Small children should only use a small, pea-sized amount of fluoride toothpaste. They cannot brush properly until they are at least six or seven, so an adult should help them brush their teeth. One way is to stand behind the child and tilt their head back so all the teeth can be seen and reached.